Updated Monday October 17, 2016 by Saskatoon Minor Basketball. The John Dewar Scholarship Program is one that recognizes two high school graduates that have played in the SMBA; but it goes much further than that. Many of us knew John within the basketball community in Saskatoon, and his involvement with SMBA. On any given Saturday, many involved in SMBA would see him in various gyms throughout the city, helping with the development for young students of the game. His involvement within SMBA went further than coaching, as he was a community coordinator for the River Heights area for many years, and along with that he was a long standing member on our Board of Directors, involved in various committees through his number of years with us. John wasn’t about just basketball... John was someone who was always focused on education for everyone he interacted with. He always focused on learning and development of students in academics, and in life skills. Further to that, he was always focused on community development and community involvement in the city. John left us all too soon. And you know I'm not alone in saying that we miss him in our lives within our Saskatoon basketball community. With all that John stood for as a coach, mentor, board member, educator, community supporter, and friend, the least SMBA can do is honor high school students with a scholarship to further their education. We had many great applicants for the scholarship, but had two stand out that aligned directly with John's values of education, community, and basketball. This coming year, the SMBA will again provide two $500 scholarships to a male and female athlete who have previously played in SMBA, who are currently playing high school basketball in Saskatoon in their Grade 12 year, and moving forward with post-secondary education. The intent of the program is to provide financial assistance for an athlete with commitment to further education and to assist in their transition into further education moving to their career. In application for the scholarship, the successful recipients should focus on their long term educational plans, but have also been involved in their community in various ways either through high school or other outside activities. Students can apply by essay (minimum one page) or video, presenting their educational plans for their future. The focus should be about their involvement in high school activities and/or volunteer experiences, including their plans for involvement in community into the future. As well, the information provided to SMBA should confirm their playing in the league. As part of the application procedure, the athlete's high school coach will be required to write a recommendation of a few paragraphs in support. Both student and high school documents should be submitted in one email to randi.mac@shaw.ca. Applications will be accepted from March 1, 2016 to June 30, 2016. Recognition of the successful recipients will occur in the 2016-2017 school year, once enrolment and attendance in a post secondary educational institution is confirmed during the school year. If there are any questions or inquiries, please contact the SMBA office at the above listed email address, or at (306) 343-1832. We are pleased to annouce our winners for the 2016 year as Liam Obrodovich and Tiegen Derksen. Liam will be attending the U of S this year and starting a career in Engineering. He has been an avid athlete throughout this high school career. Playing basketball and football he learned all about what it means to be a team player and how to work hard on an off the court or field. Liam maintained a very high average throughout his years in high school. Doing this is not easy when your schedule is very consumed with sports. Congratulations Liam! We wish you all the best in the future. Tiegen will also be attending the U of S with the goal to enter the Education program. Tiegen comes from a very active family of basketball players and he has followed right in their footsteps. Tiegen has been involved with the SMBA right from Dunkaroos. He has been a player and a referee for many years. Tiegen was also a part of the Aden Bowman Student Council where he was a part of many events in an origanizational role. Basketball has played a huge role in making the person that he has become and realizes that there is so much more to sports than just the game. Congratulations Tiegen! We cannot wait to see what your future brings. Once again we had many great applicants for our John Dewar Scholaship for the 2015 year. Our award winners this year were both from Centennial Collegiate and both have great basketball participation and community participation. Our winners are Dane Bartel and Autumn Dawe-Baillie. Autumn will be starting her schooling in the Arts and Science area. Her goal is to get into education or business. She has a true love for the game of basketball and has been very active in sports and other clubs in her school over her high school years. Autumn has been involved with the SMBA for several years as both a player and a coach. She is now encouraging her younger siblings to create a love for the sport as well. Good Luck Autumn! Dane is pursuing his nursing degree. His past experience with Easter Seals and PAAL, as well as many others, has ignited his passion to help others. His life has been touched by those in need and has spent many hours volunteering his time to help where help is needed. Dane participated in the SMBA as both a player and a coach. We wish Dane much success in the future. There were many great applicants that submitted applications for the scholarship this past year. I wish that we were able to provide a scholarship for each person that submitted. Thank you to everyone that applied. 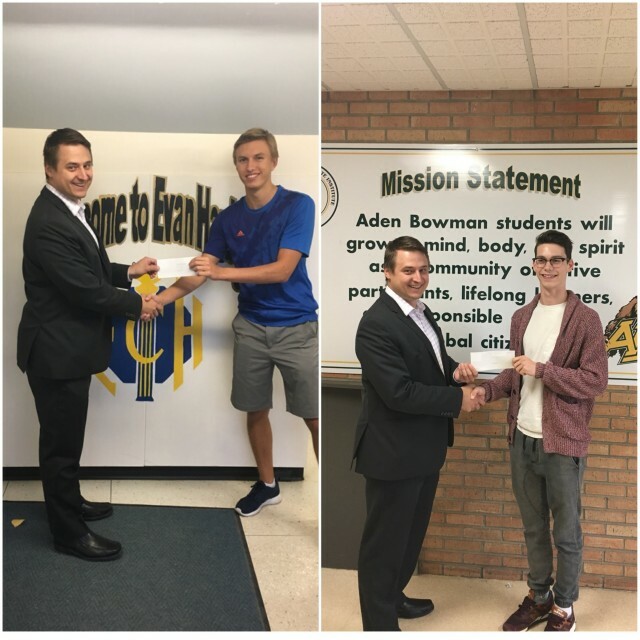 For the first ever John Dewar Scholarships, I would like to congratulate Kendra Sepke and Ben Njaa in receiving the two awards this year. Kendra is completing her first year of studies in Arts and Science. Like John, she is focused on education, wanting to get involved in special education to have a positive impact on the lives of those involved in such programs. Kendra played in the SMBA for nine years, and also played senior basketball at Evan Hardy for three years. Ben is completing his first year of studies in Kinesiology. Ben played in the SMBA for ten years, and was a captain for his senior basketball team at Aden Bowman, while also competing at a high level in high school football. Like John, Ben is heavily involved in volunteerism and commitment to improving the communities he is involved in.